Some of the little things from our week. -Cooler mornings and walks with the girls. -The swishing sound of Mia's diaper as she learns to crawl around the house. -Asher walking out the door with his backpack on. He looks so big. -My cute little sister and her 6 month baby belly. -This little guy sitting on my mantle. 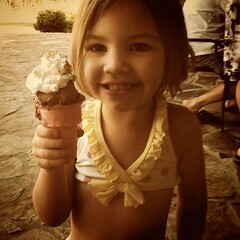 -Giant ice cream cones at Gigi and Pas' house. Piled way too high with cool whip and sprinkles. -Late night texting with my sister that results in a lot of "LOL" even though I hate that term, sometimes it's all you can really say. -Brandons hugs. They're just good. -A pair of old running shoes that form to my feet and make me want to run. -Mia's first time on a swing with huge smiles and laughs. -My 55 yr old dad planking on the top of a kids playground. -Bella girl getting her first hair cut and daddy tearing up as he watched. -Dinners all together, even the messy spaghetti ones. -Night time begging that never fails to end in a bit more snuggling. -The sounds of a quiet house filled with my sweet sleeping lovies. Big and small. What a wonderful list of little things! 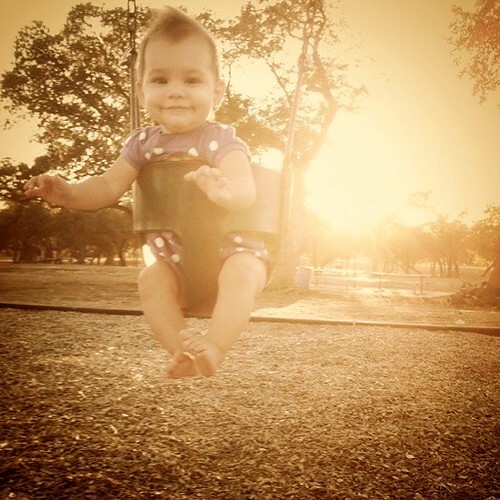 Your baby girl in the swing is adorable! I hope you got a pic of your dad planking. That is too funny. Thanks for sharing your little things with us. Stopping by from the link-up and I love your list of little things! What a great quote to end it with as well! I love me some sleepy time tea! Great list...laughed when I read about your dad planking! that last quotation from a thousand gifts is just beautiful. thank you for sharing! I loved your list :-) all of them made me smile!